Sarah is no ordinary girl: she can control the weather with her emotions. But in Doolittle Falls where superheroes walk the streets (and fly over them), Sarah's powers aren't enough for admission to the prestigious Hero Academy. Not to mention that her mother is a notorious Supervillain and the archnemesis of America's favorite Hero, Freedom Man. 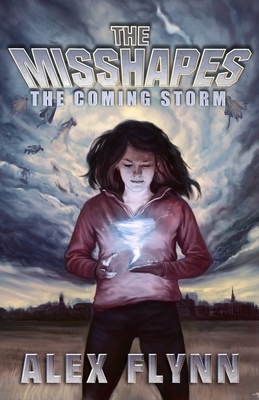 Instead of being accepted to the school of her dreams, Sarah is marked as an outcast with powers - a Misshape. Now she's stuck with a ragtag group of fellow Misshapes, her dreams of heroism on hold indefinitely. Yet Sarah is determined to harness her powers to win a place at Hero Academy. But the path to greatness won't be easy. Her brother's rebellious streak is starting to wear thin, she has an intriguing (and smoking hot) new mentor, and an unexpected romance blooms with superstar Hero Freedom Boy. And when Doolittle Falls comes under threat of annihilation, Sarah has to prove there may be more to the Misshapes than everyone thinks. Alex Flynn is the pseudonym for the writing team of Stuart Sherman and Elisabeth Donnelly. They met at a clandestine book club in Boston, where they broke into a fortified tower in order to discuss literature. They like garrulous Irish writers, Pushing Daisies, Axe Cop, and anything involving The Tick. Their secret lair is currently in a hollowed out volcano in Brooklyn. In addition to co-writing The Misshapes, Donnelly is cultural journalist who has written for the New York Times Magazine, The Boston Globe, The L.A Times, Paris Review Daily, GQ and many others. Sherman is a bioethicist, health policy analyst and a former contestant on the game show Who Wants to be a Millionaire.